Somewhat surprisingly, Aaron Judge made his return to the Yankees lineup last night. He’d been taking batting practice and hitting in simulated games, so it was clear his return was imminent, but I’m not sure anyone expected it yesterday. It seemed like Judge would return against one of the lefties tonight or tomorrow, if anything. I’m glad he’s back. Now Judge can begin getting back up to speed at the plate. Now that Judge is a full player again, the Yankees have five players for four lineup spots (three outfield plus DH): Judge, Brett Gardner, Aaron Hicks, Andrew McCutchen, and Giancarlo Stanton. 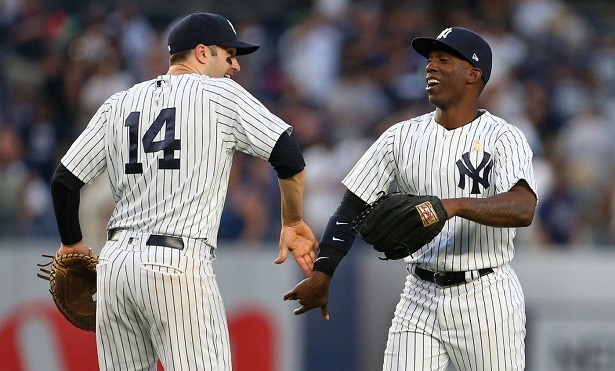 The Yankees will go from playing Shane Robinson and Neil Walker in right field to playing two MVPs (McCutchen and Stanton) and an MVP runner-up (Judge) in the outfield. Pretty cool. Judge has to play as much as possible going forward. There are only 12 games remaining in the season and he’s been out two months now with the wrist fracture. He needs as many at-bats as possible to get back up to speed at the plate. That’s the easy part here. When doling out outfield/DH playing time, Judge has to be the priority. There are a few other things that have to be considered here as well. 1. How is Stanton’s hamstring? We haven’t heard much about it lately. Stanton has been the designated hitter in 13 of the last 16 games — he played left field three times in a four-game span last week — and, prior to last night, McCutchen had started every game in right field since the trade. I feel like McCutchen would’ve had a DH day at some point had Stanton’s hamstring been completely okay. Seems like he’s still somewhat limited in his ability to play the field. 2. Who plays left when Gardner sits? Last night it was McCutchen, who went into the game with five innings worth of big league experience in left field, all within the last few days. He admitted the other day he is not comfortable out there, which isn’t surprising. Stanton didn’t seem to comfortable in left when he first made the move in Spring Training. Eventually he figured it out. McCutchen doesn’t have “eventually.” He has 12 games. 3. The Yankees haven’t clinched anything! This is kind of a big deal. The Yankees are limping to the finish right now and they haven’t clinched anything. Not a postseason spot and certainly not homefield advantage in the Wild Card Game. 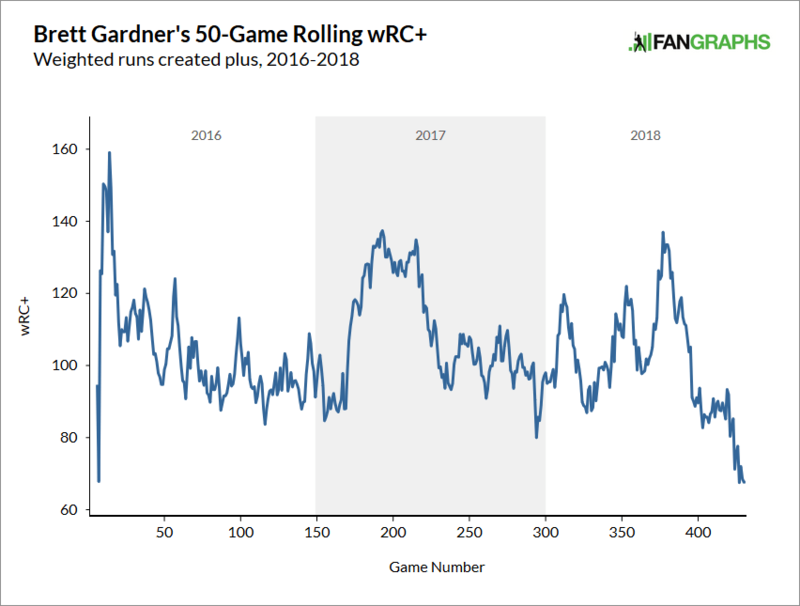 Until that happens, they should play their best players, and Gardner is not one of their best players at the moment. Hicks, Judge, McCutchen, and Stanton are best able to help the Yankees get things clinched. Gardner’s slide since the All-Star break makes this a relatively easy call for Boone. 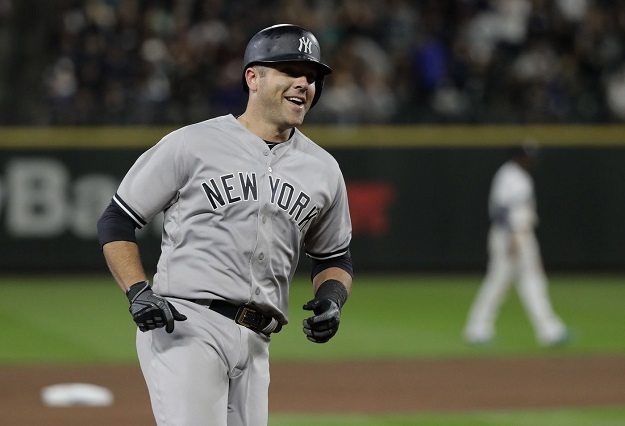 It’s not the move he or the Yankees want to make, they’d rather have a productive Gardner raising hell atop the lineup and pushing everyone else for playing time, but that is not the case. We’re past the “give him some time to see if he figures things out” point of the season. Judge is back and he needs to play, and the other three outfielders give the Yankees the best chance to win. Eleven losses in the last 19 games and recent series losses to the White Sox, Twins, and Blue Jays. The White Sox and Blue Jays series were at home too. The Yankees are 29-25 since the All-Star break and during that time they’ve a) bombed out of the AL East race, and b) seen their lead on the top wildcard spot trimmed from eight games to 1.5 games. It’s three games in the loss column when you include the tiebreaker, if that makes you feel better. This weekend’s series loss the Blue Jays was not a bummer out-of-nowhere series loss like that Texas series back in May. 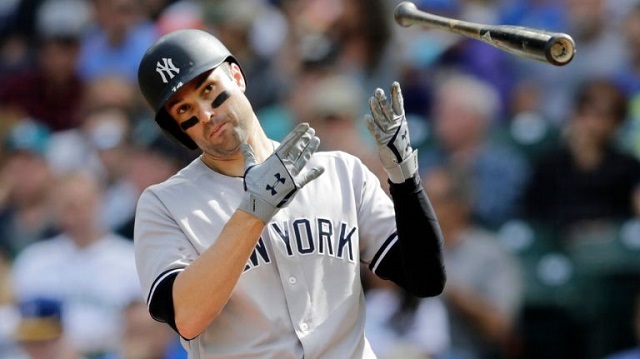 It was more of the same from a generally underperforming Yankees squad that has become more and more lifeless as the season has progressed, to point where they are now thoroughly unexciting even while threatening the single-season home run record. How do you manage that? The 2018 Yankees have, somehow. The Yankees have used up pretty much the entire cushion they built in the first half, and now they’re in a mad dash to the finish to clinch homefield advantage in the Wild Card Game. They have 13 games remaining, ten of which will be played against the Rays (four games) and Red Sox (six games). The Athletics, meanwhile, have 12 games remaining. They’ll play nine of them against the Twins (three games) and Angels (six games). Yikes. Gary Sanchez: Hitting .188/.284/.408 (87 wRC+) in 334 plate appearances overall and is 9-for-47 (.191) since returning from the disabled list (the second time). Luis Severino: A 3.46 ERA (2.99 FIP) in 179.1 innings isn’t bad by any means, but he has been one of the worst pitchers in baseball (6.35 ERA) since the All-Star break. Giancarlo Stanton: Not counting his partial rookie year, he’s on pace for his third worst AVG (.265), second worst OBP (.341), third worst SLG (.501), and second worst wRC+ (125 wRC+). Dellin Betances, the team’s best reliever, has been generally awesome this season but has had some hiccups lately, including yesterday. Didi Gregorius has been great overall despite that ugly May and the recent heel injury. Masahiro Tanaka has been very good overall and ace-like for more than two months now. The first half wasn’t pretty though. Sonny Gray? Oy vey. Don’t even get me started on him. On one hand, the fact the Yankees are 91-58 despite Sanchez being terrible, Severino’s second half, Stanton falling far short of expectations, and all that other stuff tells you how strong the rest of the roster has been. Where would the Yankees be without Miguel Andujar and Gleyber Torres? Good gravy. I don’t even want to think about it. Aaron Hicks, David Robertson, Jonathan Holder, J.A. Happ … they’ve all helped pick up the slack. On the other hand, the American League is so top heavy and competitive — the four best records in baseball belong to AL teams, and the Indians are not one of those four despite already clinching the AL Central title — that the Yankees have no shot at doing anything meaningful in the postseason without getting more from their stars. They might not host the Wild Card Game without getting more from those guys. 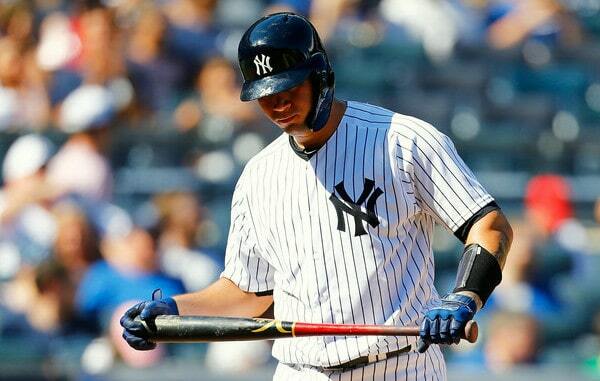 Whose fault is it the Yankees’ top players are underperforming? The blame should always start with the players. In Severino’s case, it’s possible he’s feeling the effects of last year’s career-high workload. Wouldn’t surprise me one bit. Stanton is presumably dealing with a ton of pressure in his first season with the team, which would be a lame excuse, but an excuse nonetheless. Gary? He doesn’t have an excuse. Unless he’s been hiding an injury and playing hurt all year, there’s no good reason for him to have a season like this. Of course, there were times Sanchez and Severino and Stanton produced at a truly elite rate earlier this year. Severino was brilliant in the first half. Stanton hit .288/.360/.549 (142 wRC+) from May 1st through August 31st and did much of that with one good hamstring. Sanchez hit .292/.396/.681 (185 wRC+) during a 31-game span from mid-April through mid-May. That success was a long time ago though. Same for Severino. Look around at the other top AL contenders and they have key players having the best seasons of their career. Mookie Betts and J.D. Martinez for the Red Sox. Francisco Lindor and Jose Ramirez with the Indians. Alex Bregman with the Astros. Matt Chapman with the Athletics. Not necessarily career years, those guys might get even better going forward — that is especially true for Lindor, Bregman, and Chapman — but this is their best season to date. The Yankees don’t have a single player like that. Maybe Gregorius and Hicks? I mean, yeah, definitely Gregorius and Hicks, but they’ve been more comfortably above-average than star-caliber. Imagine how good the Yankees would be if Sanchez and Stanton were performing up to their career norms, and Didi and Hicks were doing what they’re doing? Imagine how much easier it would be to deal with Severino’s struggles if Gray wasn’t a mess? What’s done is done. Can’t go back and change it. The only thing the Yankees can do it be better going forward, and the first step in being a better team is getting the best players to actually be the best players. We all love Andujar and Gleyber. Things were much better when they were like the fourth and fifth best players on the team though, not the best and second best. Those two have done a lot of heavy lifting lately. The Yankees’ best players haven’t played up to snuff for weeks now, in some cases months, and the result is a small margin for error in the standings. The Yankees and Mariners continue their three-game weekend series later today. Much later today. It’s a 9:10pm ET start. Literally the latest game on the schedule today. So it goes. Here are some links and notes to check out in the meantime. According to Nick Cafardo, the Yankees were “in the hunt” for Madson Bumgarner prior to the July 31st non-waiver trade deadline, but the asking price was too high. My guess is that asking price included Gleyber Torres plus more, possibly a lot more. Bumgarner strikes me as one of the least likely to be traded players in baseball. I think it’s far more likely he signs an extension than gets traded. Never hurts to make the call though. Wouldn’t surprise me if the Yankees check in again this winter. 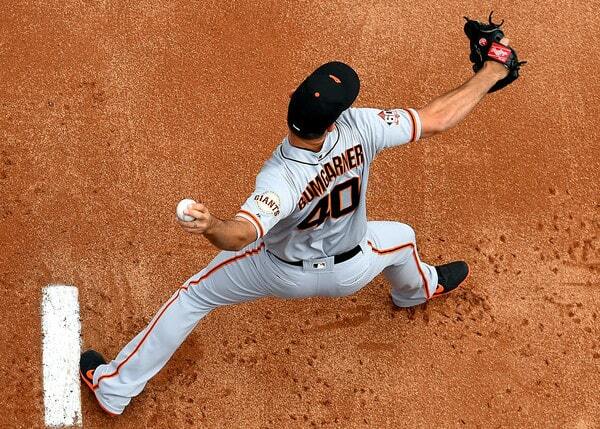 Bumgarner, who turned 29 last month, has a 3.07 ERA (4.08 FIP) in 105.2 innings since returning from a fluke finger injury (a comebacker broke his pinky in Spring Training). As good as Bumgarner is now and has been throughout his career, he’s starting to show some of decline. Strikeouts are down, walks and homers are up. Six straight 200+ inning seasons from age 21-26, plus all those deep postseason runs, might be catching up to him. Felix Hernandez threw a ton of innings early in his career and he started to lose it age 29. Hmmm. Never too early to look ahead to next season, right? Right. A few days ago MLB released the 2019 Spring Training schedule. The Yankees open Grapefruit League play against the Red Sox on Saturday, February 23rd, next year. The spring home opener will be Monday, February 25th, against the Blue Jays. The Yankees close their 32-game spring schedule with an exhibition game at Nationals Park on Monday, March 25th. Opening Day is Thursday, March 28th. Here is the team’s spring schedule. The Yankees have not yet announced their 2019 reporting dates. The last two years the Yankees had pitchers and catchers report ten days before the Grapefruit League opener and position players six days before the opener. Based on that, pitchers and catchers will report Wednesday, February 13th, with position players reporting Sunday, February 17th. Those are just my estimates. Official reporting dates usually aren’t announced until mid-to-late November sometime, after the awards rush. No real surprises here nor any notable omissions. Maybe Luis Severino’s fastball? He does have the best average velocity among starters again. Well, whatever. Last year I made a kinda sorta bold prediction and said Green would top Law’s best fastball rankings this year. Came close. He’s top five. Earlier this week MLB announced each team’s nominee for the 2018 Roberto Clemente Award, which is given annually to the player who “best represents the game of baseball through extraordinary character, community involvement, philanthropy and positive contributions, both on and off the field.” CC Sabathia is the Yankees’ nominee this year. Here are the 30 nominees. Three Yankees have won the award: Derek Jeter (2009), Don Baylor (1985), and Ron Guidry (1984). Current Yankee Andrew McCutchen won it while with the Pirates in 2015. Amazingly, MLB turned a prestigious award intended to honor community involvement into a popularity contest. The Roberto Clemente Award winner will be selected via fan vote. Here’s the ballot. The winner will be announced during the World Series. Among other things, Sabathia and his wife run the PitCCh In Foundation, which promotes and supports educational and athletic activities for inner city youth. During Thursday’s off-day Sabathia gave away roughly 1,700 backpacks with school supplies to kids in the Bay Area, near where he grew up. Pretty cool. Congrats to the big man. Just getting nominated for the Roberto Clemente Award is an honor. Even in a season in which they’re on pace for their best record in a decade, the Yankees continue to find new ways to lose games. On Thursday night they suffered one of the most shocking upsets of the season as they coughed up a two-run cushion in the top of the ninth inning and lost 8-7 to the Tigers. It was the first time they lost a home game they led by multiple runs at the start of the ninth since August 27, 2012 against the Blue Jays. Every other team had at least one such loss in that span. Going back further, the only other time in the last 15 seasons — since 2004 — that the Yankees lost a game in the Bronx they led by at least two runs entering the ninth was June 28, 2012 vs the White Sox. J.A. Happ threw his worst start in pinstripes, allowing five runs on 10 hits, including three game-changing homers. It’s hard to do all that while getting no more than 13 outs. The last Yankee to give up at least 10 hits, five runs and three bombs in an outing of 4 1/3 innings or fewer was Carl Pavano on May 11, 2005. Ugh. Giancarlo Stanton had a historic night as he finally went deep for his 300th career home run, a two-run shot in the third inning that gave the Yankees a brief 2-1 lead. He became the fifth-fastest to reach the mark in terms of games (1,119). Stanton is also in an exclusive club in terms of his age and power/on-base ability. Among right-handed batters, the only other players to compile at least 300 homers and an OBP of .350 or better through their age-28 season are Alex Rodriguez, Albert Pujols and Jimmie Foxx. The Yankees rebounded from Thursday’s crushing loss with another crazy comeback win on Friday. They finished August with a 17-13 (.567) record, which was their worst monthly record of the season — but that still put them in elite company. The last time the Yankees had a win percentage of .567 or better in each of the first five months of the season (combining March/April) was 1998. 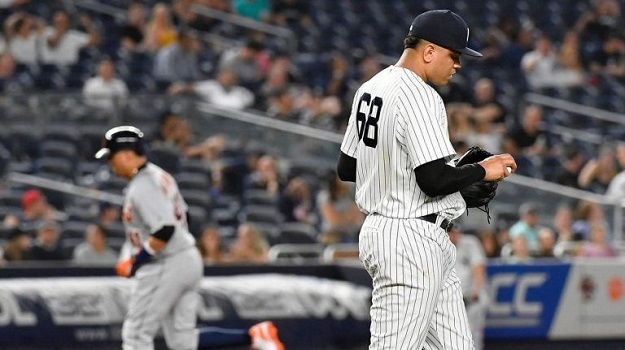 The Yankees would need another rally, however, after Zach Britton suffered a meltdown as he tried to protect the one-run lead, yielding a game-tying single in the seventh and a sac fly in the eighth. It was the first time in his career as a reliever that he surrendered a go-ahead sacrifice fly. Britton was saved from goat status by the clutch hitting of Gleyber Torres, who delivered a game-winning bases-loaded two-run single in the eighth inning. 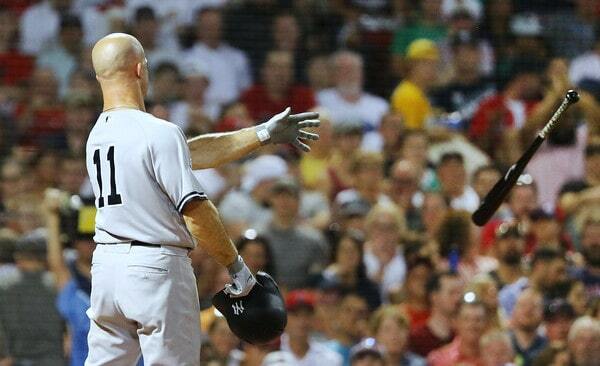 It was his fifth game-tying/go-ahead hit in the eighth inning or later, the most on the Yankees this season. 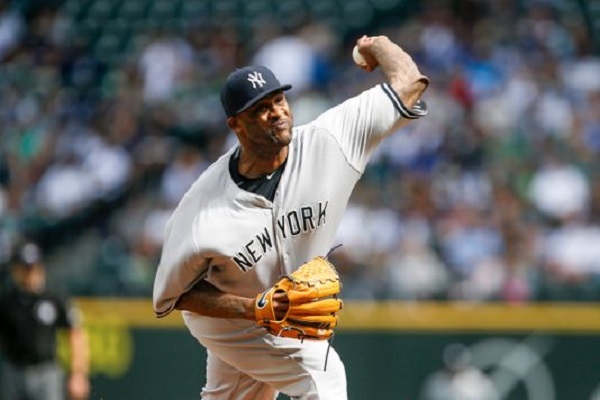 The comeback mojo continued on Saturday as the Yankees overcame another sluggish start offensively and rallied to win, 2-1, despite getting only two hits. This is the third time in the last three seasons they’ve won a game with no more than two hits; before this stretch, it hadn’t happened since 1994. Oh, and there’s this stat too: Their three wins with two hits or fewer since the start of 2016 are the most of any team. But what made this win so unique is the fact that the Yankees also struck out 10 times. Obscure Yankeemetric alert! Saturday was the 18th time since 1908 (as far back as we have complete boxscore data) that they won a game with two or fewer hits, but it was the first time they also had double-digit strikeouts. For the second straight night their first hit was a game-changing homer, this time it was a two-run blast in the fifth inning by Gleyber Torres. His 22 homers are the most in Major-League history by a second baseman age 21 or younger in a single season. 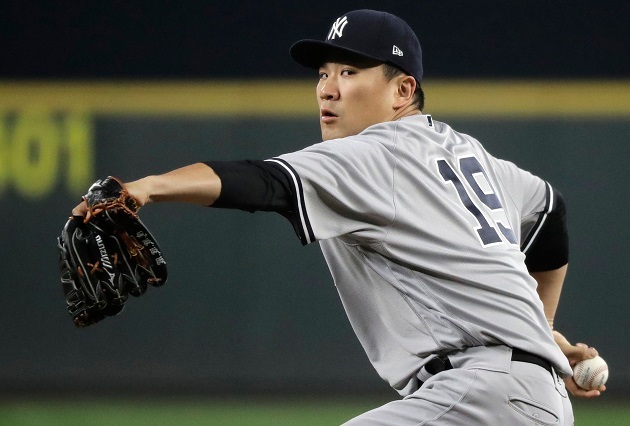 Masahiro Tanaka battled through a shaky first inning during which he loaded the bases with no outs and escaped with only one run on the scoreboard. His ability to pitch out of tough situations and limit the damage has been an underrated part of Tanaka’s season. He’s held batters to a .100 batting average (4-for-40) with runners in scoring position and two outs, fourth-best among MLB starters (min. 40 batters faced), behind a trio of Cy Young contenders: Blake Snell (.063), Chris Sale (.073) and Aaron Nola (.094). 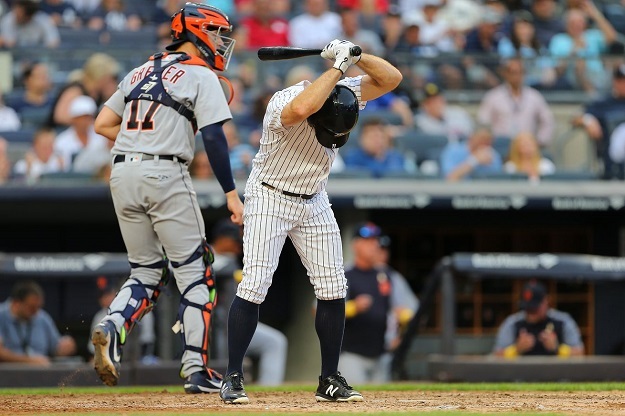 The Yankees finished off their homestand with a dud, an 11-7 loss that featured a bunch of heart-wrenching warning-track outs but ultimately too many big deficits to overcome. The Yankees were 33-13 at home in the first half of the season; since the break, they are just 15-11 in the Bronx, and 23 of the 26 matchups have come against teams that entered gameday with a sub-.500 record. Miguel Andujar went 3-for-4 with a double, pushing his batting average up to .301 and his slugging percentage up to .530. The only Yankee rookie in franchise history to finish a season with at least a .300 batting average and a .530 slugging percentage (min. 300 PA) was Joe DiMaggio in 1936 (.323 BA, .576 SLG). Last night was a bit of a hiccup. The Yankees lost for only the sixth time in their last 21 games, and after their two previous losses, they responded with four straight wins. Losses happen. Preventing one loss from becoming a losing streak is the most important thing the Yankees can do, and they’ve done that well the last three weeks now. Hot hot hot in New York today. Slightly less hot tonight, but still hot. Nice day though. First pitch is scheduled for 7:05pm ET and YES will have the broadcast. Enjoy the game. Later tonight the Yankees and Orioles kick off Players’ Weekend with the first of four at Camden Yards. They’ll play one game today, two games tomorrow, then one game Sunday. Inexplicably, the series finale is an ESPN Sunday Night Baseball game. The 2018 Orioles have to be the worst team ever on Sunday Night Baseball, right? Well, anyway, here are some links and notes to check out. According to Jon Heyman, the Orioles approached the Yankees about a potential Adam Jones trade at some point earlier this month. Jones has cleared trade waivers and can be dealt anywhere, but he has 10-and-5 no-trade protection, and he used it block a deal to the Phillies before the trade deadline. Heyman says there’s some belief he’d be more willing to consider a trade to an AL contender. Jones spoke about his decision to block the trade to Philadelphia during a recent R2C2 podcast. 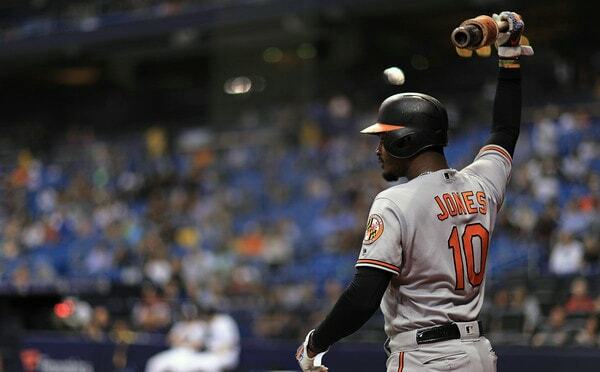 Jones, 33, is hitting .281/.315/.431 (101 wRC+) with 13 home runs this season, which is a typical Adam Jones season. He’s an impending free agent and he recently shifted over to right field in deference to center field prospect Cedric Mullins. I’m all in Jones. Good player, great and honest dude. The money doesn’t work with regards to the luxury tax plan, but Jones would be a great fit as an Aaron Judge fill-in and spare bat down the stretch. Heyman says the Yankees passed because they expect Judge back soon. Alas. Former Cardinals closer and current free agent Trevor Rosenthal will throw for teams in October, he announced on Twitter. Rosenthal is currently rehabbing from Tommy John surgery. He blew out his elbow late last year and St. Louis non-tendered him over the winter because it was his final season of team control, and there’s no sense in paying a dude several million dollars to rehab when he’ll become a free agent after the season. The Yankees did the same thing with Nathan Eovaldi in 2016. Rosenthal, who is still only 28, struggled as he battled elbow woes in 2016 and 2017, but he was a monster from 2012-15, pitching to a 2.66 ERA (2.49 FIP) with 30.5% strikeouts as the top high-leverage reliever on a contending team. Greg Holland’s contract with the Rockies last year set the market for a former All-Star closer rehabbing from Tommy John surgery. Colorado gave Holland a one-year deal worth $7M guaranteed that including a player option and bonuses that could’ve pushed the total value to $35M across two years. It’s been a while since the Yankees rolled the dice on one of these injured guys (I think Andrew Bailey was the last? ), but I’m sure they’ll check out Rosenthal’s workout. No Dellin Betances among the best relievers? Betances gets no respect. His failures get magnified and his successes are just something people ignore until the next time he fails. I still love ya, Dellin. Here’s a fun one. According to Kaz Nagatsuka, Don Mattingly will manage a team of MLB All-Stars during an exhibition series against NPB All-Stars in Japan in November. The five-game series will be played in three different ballparks from November 9th to November 15th. The MLB Japan All-Star Series has been played irregularly since 1986. MLB is 48-20 all-time in the series but Japan did win three of five in 2014, the last time they played. The MLB All-Star roster won’t be finalized until “sometime in October or late September,” according to MLB vice president for Asia Pacific Jim Small. I am certain MLB wants Shohei Ohtani there. I am also certain they’d like a Yankee on the roster because the Yankees are the sport’s most recognizable team. The Yankees are going to the postseason though. It might be tough to get a firm commitment from a player on any postseason bound team in September or early October. 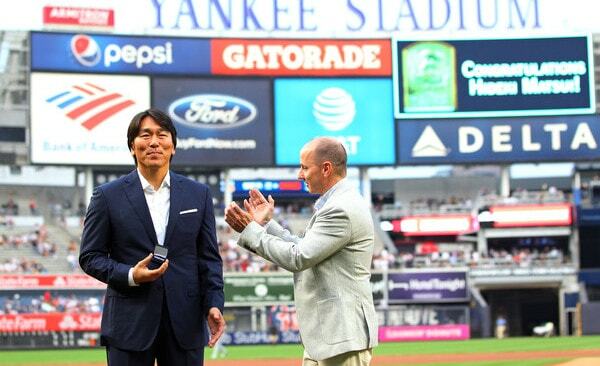 The last Yankee to participate in the MLB Japan All-Star Series? Mike Myers in 2006. For real. Jason Giambi and Bernie Williams both participated in 2002.